The PartyPoker WPT Merit North Cyprus Classic is the highlight of the month for many European poker players, who don’t have the resources to participate in the major Asian series. The tournament is hosted in a luxurious casino in Cyprus and is sponsored by the prestigious poker room, which provides players with plenty of reasons to pay the buy-in. In 2014, there were hundreds of players who booked a seat at the main event, which is the most anticipated tournament of all those scheduled for early October. The game was played in shorthanded format, which explains why the final table only featured six players and Nicolas Chouity was the chip leader at the time. He had a significant advantage over the pack, with Alexander Lakhov being the only player within striking distance. Much to his credit, Alexander managed to stay close to the leader and when opportunity presented itself is overtook Nicolas. Very little changed in the first two hours of the final table, with three players from Russia competing for the trophy, one of them was eliminated fairly quickly. Nicolas Chouity sent two players to the rail, but when three handed play began, he realized that it was time to take more chances, to consolidate his position. The player from Lebanon was unlucky to get involved in some big hands and lost all of them, on two occasions starting as favorite. The way was paved for the remaining two Russians but contrary to what those present expected, they didn’t agree on splitting the pot according to their stacks. Instead, they preferred to play until the final hand was dealt and this proved to be a winning move for Alexander. For almost 2 months, Las Vegas was the cornerstone of land-based poker, with the World Series of Poker being the highlight of June and July. Pretty much all those who have the skills, resources and the will to put them to the test bought in for one of the side events of the WSOP or paid the buy-in for the main event. Now that the action subsided and the name of the nine finalists was revealed, players need to look elsewhere for excitement and opportunity to win money. There are a couple of tournaments still scheduled for August that are unfolding in the United States, with the WPT Legends of Poker being by far the most exciting one. Bicycle Club in Bell Gardens, California will be the gracious host for this event and the main tournament will set players back $3700. It will start on August 23 and will conclude one week later, so there is just enough time to raise the funds. http://www.choctawcasinos.com/durant/entertainment/eventscalendar/tabid/169/vw/3/itemid/5131/d/20140717/Card-Player-Poker-Tournament.aspx has the details for another tournament that is to take place in the US, with a far more reasonable buy-in. One of the first major tournaments in Europa is the GUKPT Reading which is the perfect warm-up for those who are anxiously waiting for the European Poker Tour. The main event is the £550 No-Limit Hold’em, which is not prohibitive even for amateur players. Action is every bit as intense in East Asia, where the Macau Poker Cup is scheduled for August, with the highlight of this series being the HKD$80,000 High Roller tournament. It will attract poker professionals from all the corners of the world, but the most participants are expected for the HKD$11,000 Main Event which starts on August 8. On exactly the same date players traveling to Europe will get to choose between the UK & Ireland Poker Tour London which is hosted by the Hippodrome Casino and the Grosvenor UK Poker Tour. Both these tournaments are probably going to attract plenty of British players, as they will find it both convenient and entertaining to participate in events of such magnitude. The buy-ins are reasonable at £275, so once again the guaranteed prize pool is expected to be exceeded as a result of more players attending the event. The European poker season officially begins with the Barcelona tournament scheduled for August 16, the first stop on the European Poker Tour. This event has a special signification, as it is the 100th tournament hosted by the EPT and will last 10 days, while making plenty of players rich. GUKPT Leeds tournament is scheduled for early September, with the £550 No-Limit Hold’em being the highlight of the series. Dominik Nitsche was among the poker professionals who came to Las Vegas for the World Series of Poker with high expectations. His desire was to win a bracelet and it goes without saying that he properly celebrated the victory when it occurred in the first events of the series. Much to his credit, he kept the dream alive and bought in for more tournaments, which resulted in another victory for the German. It was Event #21 – $1k NLHE that brought him the coveted victory, which is the second this year and third overall, not to mention that he also took home $335,000. The competition was intense throughout the tournament, but no poker professional made the final table which greatly simplified his mission. Dominic is among the best online poker players and the fact that he found a way to replicate his success at live tables suggest that he made a successful transition. The beauty of participating in the World Series of Poker is that you don’t get to compete exclusively at Texas hold ’em tables, but can participate in different tournaments. HORSE events are by far the most demanding, because those who sit down at these tables need to be equally skilled at playing different types of poker. Event #22 – $10k HORSE Championship is the highlight of the series and it was Christopher Wallace who made the most of this rare opportunity to showcase his unique skills. The final table took longer than expected and the remaining three players brought equal stacks in play, therefore it took a few hours for a winner to be decided. Wallace took an early lead and grew it one step at a time, until Richard Sklar was eliminated and the heads-up battle ensued. He outshined Randy Ohel in the final phase of the tournament, to win in excess of half a million dollars and the coveted bracelet. Two of the best online poker players, met again over the week at Full Tilt Poker playing two different games at nosebleed limits. In the past, Phil Galfond got the best of Viktor Blom, but the Swede is quickly closing the gap and in their last contest he won more than $600,000. The amount is staggering, but unfortunately for Phil, things went from bad to worse when he decided to move to other tables in an attempt to offset his losses. He joined Dan Cates as the only two players to lose more than $1 million this week, a forgettable record that virtually wiped out all the profits they made in 2014. Cates didn’t lose a dime to Blom, but the Swedish poker player extracted maximum value from those hands played against Galfond. They chose to compete at 2-7 triple draw and 8-Game tables and on both occasions, Viktor emerge victorious. The two players competed for a total of 12 hours, with the first four being less interesting, as action picked up speed at the middle of the session. They were playing at $300/$600 pot-limit Omaha tables, so it comes as no surprise that things quickly got out of hand. Blom’s overly aggressive style of poker caught Phil off-guard and in less than two hours, he stripped him of more than $500,000. Galfond did his best to limit the losses but he never found the strength to claw his way back in the game. After a while, they moved to $2,000/$4,000 2-7 triple draw tables but Phil was unable to put his vast experience and incontestable abilities to good use. The session ended virtually undecided, so he had no choice but to accept the $600,000 lost. At the end of the day he had $1 million less in his account and it is most unlikely for Phil to finish the month about the profitability line. “FakeSky” and Gus Hansen were two other players who lost significant amounts this week, while poker players who used the nickname “GSinishtaj” and “thecortster” won $60,000 each. 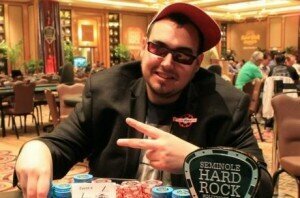 The other big winner of the day was Sebastien Ruthenberg who won $145,000, his biggest score in one day this year. Immediately after the Aussie Millions Main Event came to an end and Ami Barer was crowned winner, the AU$100,000 challenge began. Despite the prohibitive buy-in, more than 60 players found it worthwhile to participate and some of them even bought in several times. Isaac and Haxton and Daniel Negreanu are two worthy examples, with both of them spending a total of AU$500,000. They were under tremendous pressure of making a deep run just to offset these losses, but only the Canadian achieved his goal. Haxton was eliminated early in the day and didn’t even make the final table, which was comprised of seven players. The chip leader didn’t have a significant advantage over the pack, which ensured the fact that the final stage of the competition will be balanced and take longer than usual. Martin Jacobson and David Steicke were eliminated in a relatively quick succession and won a combined amount of AU$800,000. Since neither of them suffered an untimely elimination and had no reason to rebuy, the Aussie Millions $100,000 Challenge was a highly lucrative event. Daniel Negreanu didn’t succumb to pressure and despite the fact that he was compelled to finish fifth or higher, he played like he was aiming the first place. He failed to make three handed play but he still finished above the profitability line, with a payout of AU$550,000. He was somewhat unlikely to be eliminated in the fifth place, but overall his performance at the AU$100,000 challenge was a success. Two of the four remaining players were struggling to stay alive, hoping that their closest rival will be eliminated ahead of them. Patrick Antonius and Erik Seidel had a snowflake’s chance in hell of making the heads-up, with a dwindling stack and facing a lot of adversity. Seidel extracted the maximum from his unfortunate situation and outlasted Antonius, to collect AU$860,000, 160k more than his rival. They had too few chips in front of them to make a difference, so despite the fact that Yevgeniy Timoshenko caused the elimination of both of them, he only started with a narrow advantage over Mike McDonald.